Daphnis watch celebrates the Versace Greek key. 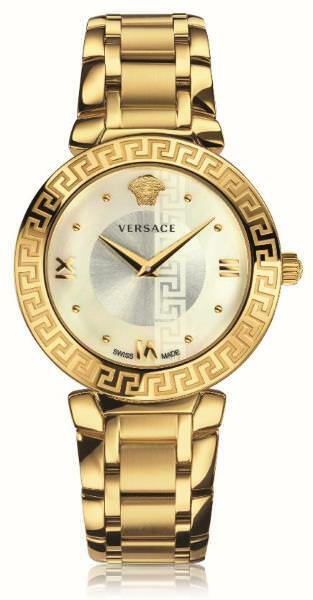 This iconic symbol of Versace is the hero of the entire construction: tone-on-tone, it crosses the enamel or mother-of-pearl dial, along the length of the strap to the top ring. In a feminine size, the new Daphnis has an original “coin” shape of the case with its lugs and with the Medusa in relief at 12 o’clock and on the crown. Daphnis comes in 6 versions and 3 colours: total look white, black or blue. They are joined by the more luxurious versions with a polished and satin-finish metal bracelet.